This week we are proud to announce our Tiger Spotlight. We would like to recognize the hard work and dedication our PK3 and PK4 teachers do on a daily basis. With the outstanding assistance of their paraprofessionals, they are able to prepare our little ones academically and artistically. Aside from teaching them daily skills, they also manage to get these little ones to perform amazing dance routines for all audiences and events such as PTOs and district functions. 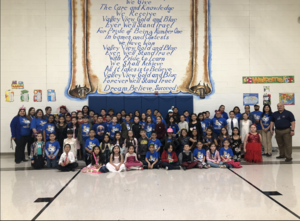 Thank you, Mrs. N. Chavez, Mrs. C. Gonzalez & Mrs. L. Palacios.